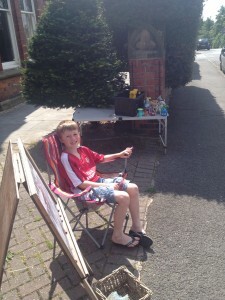 For the last 4 days we have been in New Quay Wales on a little family holiday, so no more decluttering has been done, but on Monday while we were packing and loading the van to go, my little boy Charlie sat outside on his deckchair with his blackboard selling bird seed for 50p along with any 3 plastic toys for 50p and…. 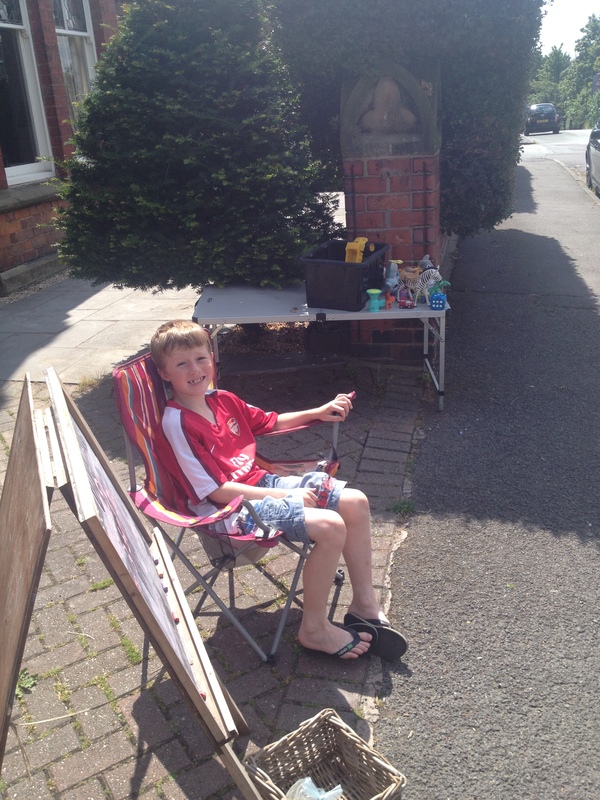 he made £11 to take on holiday (which naturally was spent on more plastic, this time several guns with Pellets to shoot at plastic cans). But hey, we’ve made a start on going through it and Charlie is keen to do it again so we should see the bottom of those buckets full of plastic by the end of the holidays I recon. Whilst away we had a day trip to Aberaeron a pretty town with coloured houses it reminded me of the childrens programme Ballamory. We popped into the Harbour Master a lovely hotel and restaurant I had visited with my girlfriends earlier in the year and had really taken a shine to the colour of their dining room walls, so wanted to know the name of the shade as this is the colour I would like to do the room that’s lurking behind that door. We tried to take a photo of it but it just didn’t look right so I asked the lady on reception and after her asking and looking in several files she said she would let me know when she found out and true to her word she text me later in the day – Farrow & Ball Stone Blue No:86..so stay tuned. On returning home this afternoon at last my parcel had arrived, a book I had ordered over a week ago, now I’m not a big reader and the last book I read, well 3 books actually was THE book…you know the one. This book is not going to have the same effect between me and my husband but i am very excited about it all the same. I saw several people recommending it in the decluttering community on twitter so hoping it will keep me focused. 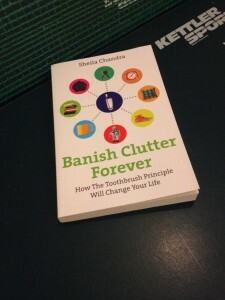 Its called Banish Clutter Forever by Sheila Chandra. Mind you don’t know when I’m going to get time to read it as its the Shrewsbury Flower show this weekend and I am helping on a stall to promote my next creative workshop “Torn Paper Collage” with Lyn Evans in September its the 15th 16th or 18th if your interested more info on my website also I’ve not watched tonight’s Bake Off as was playing in a tennis match. While I’ve been typing this up I’ve had the washing machine on making a start on the huge pile from a family of 5 being at the coast for 4 days with sand in everything, my utility is a small room off the hall down the corridor with no room to dry any sheets (remember I run a B&B) clothes towels etc so all my drying is done on the line outside, weather permitting or on airers in the kitchen over night if the Aga is on… its not at the moment due to it being summer or drying on airers in our bedroom which is not ideal, but with the room lurking behind that door becoming clearer I’ve masses of room so the airers are in there around the table tennis table..Oh its a big room! its so lovely to be able to have the table tennis table out rather than folded up which it has been for far too long …due to all the boxes and stuff surrounding it. A Professional declutterer asked me what my plan was for the room once it was decuttered, but I’ve not been sure what this room would be used for. 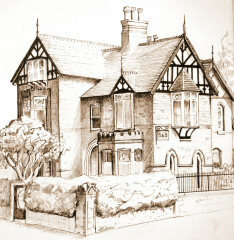 I don’t like the thought of it being a dining room, Breakfast for my guests at the B&B is served in my kitchen (that way if i drop a sausage they know, plus I’m nosy, I like to know what my guests are up to, where they have been etc I like to chat and would feel like a glorified waitress. My B&B landlady friends suggested it should be made into a ground floor guest room but with 3 children and 2 guest rooms already, I think that’s enough of work/life balance for me..so at the moment I’m thinking games room slash laundry/drying room.. I do like the idea of a worktop with 5 big baskets on, so when the families clothes were dry they could look in their own basket rather than rummaging on my bedroom floor to find what they wanted as I hadn’t had time to take their clothes up to their rooms and put them away nicely for them(In my/their dreams)..anyway just an idea at the moment…Oh and an office area. That’s exactly it Louise, getting the balance right. Already I love the fact the washing is there on airers rather than all over our bedroom to think you couldn’t have put your foot down in the room lurking behind that door without trampling on something and now its nearly clear ready to be spruced up.